Straddling the northeast branch of the Anacostia River just outside of Washington, D.C., is a half-square-mile patch of green called Edmonston. It’s a tiny Maryland town where, despite its distance from the Chesapeake Bay, the residents seem to understand that what they do here affects what happens there. 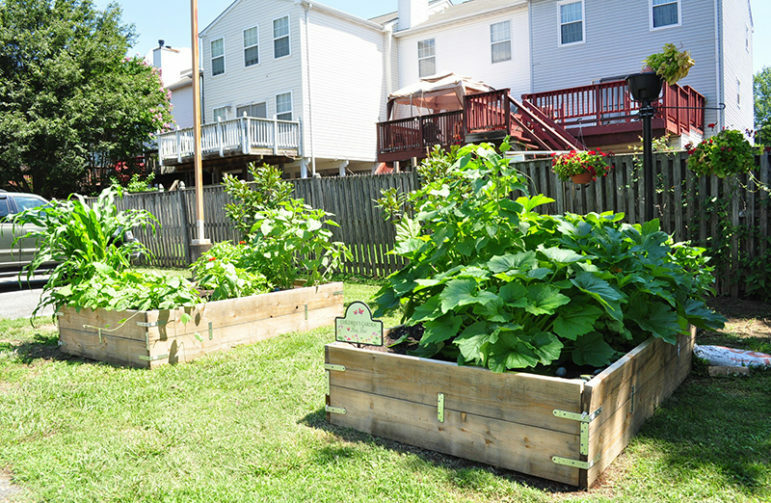 What started in the early 2000s as an effort to ameliorate flooding on the town’s main thoroughfare has snowballed into a series of water quality-minded projects that are sprucing up streets, filling empty lots with community gardens and reducing the amount of polluted stormwater flowing into the Anacostia River. The projects also have burnished the town’s sense of identity, setting Edmonston apart from the maze of Maryland suburbs tucked inside DC’s bustling beltway in Prince George’s County. Like the adjacent towns of Bladensburg and Riverdale, almost half of Edmonston’s 1,500 residents are Latino and 35% are African American. The median income in Edmonston is $19,000 and, other than one apartment and one townhouse complex, most residents live in the small, well-maintained single-family homes that have filled its streets since the town was incorporated in 1924. Environmental groups have been trying for decades to better engage low-income and minority groups like those that live in Edmonston, particularly in local water quality issues that ultimately impact the Chesapeake Bay. The state-federal Chesapeake Bay Program has created a workgroup aimed at tapping a more diverse set of stakeholders for leadership roles in Bay restoration. Nationally, the Green Diversity Initiative released a report in 2014 which found that the staff and volunteers of environmental organizations often fall short of having the same ethnic diversity as the communities they are trying to serve. But, in Edmonston — thanks in part to charismatic, Bay-minded community leaders and a series of well-executed projects — engaging a diverse mix of residents in environmentalism has become second nature. “We’re a very working-class community. But we’re as green a community as you can probably find anywhere,” City Administrator Rod Barnes said proudly before listing the evidence. For a town of its size, Edmonston has an outsize number of rain barrels, solar panels and native plant landscapes. The city has a staff of three people and an annual budget of $1.2 million, yet it has electric vehicles and a charging station at the town hall and collects recycling and leaf litter for free. The leaves are composted by the nonprofit, urban farm in town, ECO City Farm. These seemingly disparate initiatives have come together over time, Barnes said, through a combination of grant funding, community engagement and focused leadership. And, he’s quick to add, most of it started between 2005 and 2011, when Adam Ortiz — now the director of Prince George’s County’s Department of the Environment — was mayor of Edmonston. Ortiz helped to form the town’s first “green team” of citizen volunteers, which, charged with implementing initiatives to improve the local environment, still leads many of those efforts. But Ortiz, who lived in Edmonston for 12 years before recently moving to nearby Hyattsville, said it was stormwater that led the town to its new identity. Near the start of his first term as mayor, Ortiz said Edmonston was struggling with its fourth year in a row of flooding along a main corridor called Decatur Street. The street crosses the Anacostia River running through the heart of the town and gives Edmonston its tag line: “A Bridging Community.” But the main thoroughfare was wider than it needed to be, adding unnecessary pavement to the problem of stormwater runoff. The project that began in 2009 transformed the half-mile strip from a nondescript expanse of pavement that habitually flooded into a functional corridor that filters polluted stormwater runoff, absorbing up to 1.33 inches of rainfall in a typical storm. City officials knew that updating the street was something they would need to do anyway, and they garnered grant funding to fill in the gaps to help the project accomplish multiple goals. To that end, the project added dozens of trees and bioretention gardens along the street’s edges as well as wider sidewalks, permeable pavement bike lanes and a street design that would slow traffic to make it safer for bicyclists and pedestrians. In the end, the project reduced flooding and showed residents that improving a street, yard or roof for water quality can come with multiple other benefits. The U.S. Environmental Protection Agency’s Region 3 recently launched a Green Street-Green Jobs-Green Town Grant Program intended to help more cities absorb stormwater while overhauling their avenues. In Edmonston, this first project was a gateway to many others, giving residents a taste for tree-lined streets that they’ve since wanted to replicate throughout town. The city is working on turning another thoroughfare in town into a green street and, at a bilingual public meeting about the project, residents said they wanted to plant more trees not only there — but everywhere. They worked with city staff to garner 55 native fruit trees from the county’s ReLeaf program and began planting them as edible forests dispersed throughout town. 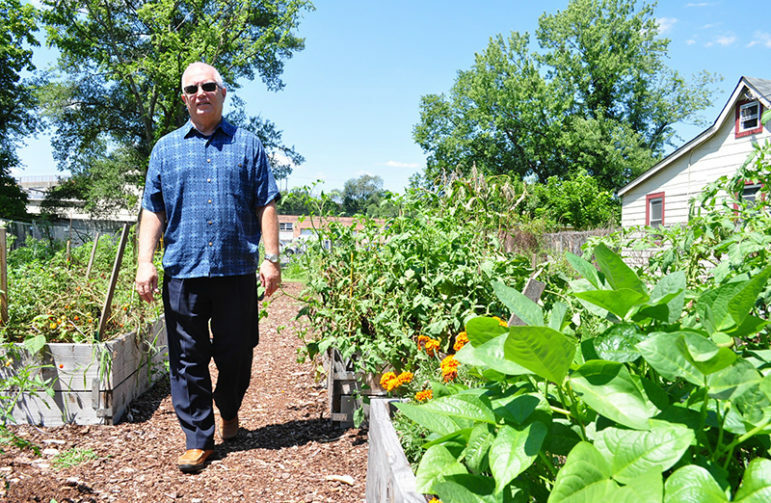 Some trees wound up in Edmonston’s community garden, which provides 10 plots for local residents, several of them from the town’s apartment complex, to grow their own food. 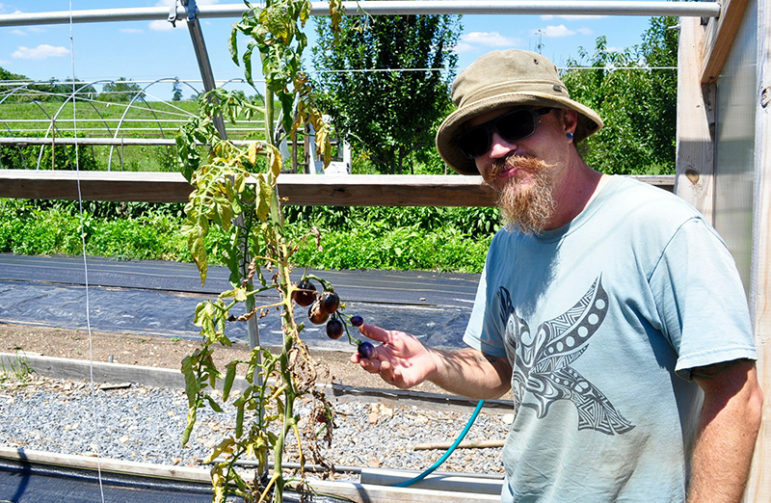 Edmonston is considered a “food desert” with a lack of affordable grocery options, so the fruit trees not only help to absorb stormwater but also provide food for residents once they begin sprouting serviceberries and pawpaws. Almost all of the tree plantings, which began as saplings in 2015, have survived with the help of volunteer waterers from Bladensburg High School’s green team — and they’re now adding leaves on several streets throughout the community. The town’s homeowners were so excited about the new fruit-bearing trees that they expressed interest in planting more at their homes. Yet another grant from the Institute of Public Health and Maryland Municipal League went to purchase 50 trees that were distributed to homeowners, almost all of which planted them the day they received them in the spring of 2015. The multi-pronged tree planting project earned an award last year from the Chesapeake Stormwater Network.